Captain Kaye is currently seeking documents to verify his incredible experiences, and for now offers his testimony as evidence of a break away human civilization based on Mars. Parts of his testimony is consistent with the claims of other whistleblowers who have previously come forward to reveal secret events on Mars. Michael Relfe, for example, claims that he also was recruited for a 20 year tour of duty that involved covert operations on Mars. Also, Laura Magdalene Eisenhower, the great granddaughter of President Eisenhower, claims that covert efforts were made to recruit her to join a colony on Mars that was headed by famed physicist, Dr Hal Puthoff. Finally, Captain Kaye’s claims that Mars has a breathable atmosphere is supported by a number of NASA images revealing small animals on the surface. To watch the ExoNews TV episode exposing Captain Kaye’s Mars experience, click here. A photograph just released from the Mars Curiosity Rover reveals a strange nearby light that appears artificial. 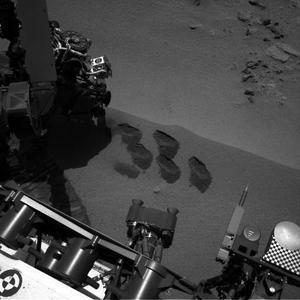 The image was part of a batch just uploaded from the Mars Curiosity Rover that were originally recorded on April 3, 2014 by the Right Navigation Camera. The image with the time stamp of 10:00:34 UTC shows an unusual light on the Martian surface only a mile or so away. The light does not appear to be related to the sun or any natural atmospheric phenomenon such as dust storms that have been known to produce lightning on Mars. The light is too distant to clearly identify but appears to be coming from underground suggesting an artificial light source located beneath the Martian surface. The Curiosity Rover image was uploaded by NASA on April 3, 2014, and was seen by Youtube user Streetcap who posted a video today revealing the strange Martian light.There is no nearby atmospheric activity such as a dust storm that the image or other images in the same batch from the Curiosity Rover reveal. Dust storms can produce lightning as was observed in imagery taken by the Mars Orbiter Camera in June 2006 that was the first confirmation of lightning on Mars. Another possible explanation is underground lightning which happens on Earth due to the rotation of molten metal beneath the Earth’s crust which creates rotating electric fields vital for creating a powerful magnetosphere. Mars, however, has no inner crustal dynamo comparable to Earth, and its magnetosphere is a fraction of Earth’s. It is therefore unlikely that underground lightning is a naturally occurring phenomenon on Mars. The light emission in the Curiosity Rover image is not likely a result of underground lightning. Another explanation may be lensflare which is caused by a light source just outside of the image field being captured on camera. The most common source of lensflare is the setting or rising sun. However the light in the Curiosity Mars Rover does not appear to be a lensfIare caused by the sun given the lack of shadows in the nearby terrain. If the light source was from the Curiosity itself, then that would have been observed in the Mars images. If both dust storm and underground lightning is ruled out, together with lens flare, then it raises the possibility that the light is an emission from some artificial underground source. Consequently, the light anomaly recorded by the Curiosity Rover may be evidence of an underground base on Mars. It has just been announced that the world’s first space tourist, Dennis Tito, is leading a private effort to send a manned space flight to Mars in January 2018. A Media Advisory titled “The Planets are Aligning for a Once-in-a-Generation Space Journey” claims that a rare alignment of the planets will be occurring that makes possible a manned mission to travel to Mars and back in 501 days. In a Media Advisory he announced the creation of the “Inspiration Mars Foundation”, a non-profit foundation that would lead the Mars mission. The Foundation, which Tito chairs, will give more details about the manned Mars mission in a February 27 Press conference at the National Press Club. Three respected space scientists are scheduled to discuss the proposed mission. Tito’s announcement follows an earlier announcement by SpaceX to establish a colony on Mars. Private efforts to create manned Mars missions, appear to be eclipsing official public efforts by NASA and other space agencies to send humans to Mars – but are they? The Inspiration Mars Foundation, a newly formed nonprofit organization led by American space traveler and entrepreneur Dennis Tito, invites you to attend a press conference detailing its plans to take advantage of a unique window of opportunity to launch an historic journey to Mars and back in 501 days, starting in January 2018. This “Mission for America” will generate new knowledge, experience and momentum for the next great era of space exploration. It is intended to encourage all Americans to believe again, in doing the hard things that make our nation great, while inspiring youth through Science, Technology, Engineering and Mathematics (STEM) education and motivation. Tito’s efforts follows a presentation by SpaceX founder Elon Musk in November 2012, where he announced plans to establish a colony of 80,000 on Mars. Taking a trip to Mars, if Musk has his way, would cost as little as $500,000. Musk revealed his long term plans in a November 16 presentation at the Royal Aeronautical Society. In an interview, Musk revealed that establishing a Martian colony was his ultimate objective, and “it always has been.” Given his recent space accomplishments, successfully sending an unmanned space vehicle to the International Space Station and back – Musk’s Mars vision is no idle pipedream. What of Dennis Tito? We will have to wait to see the February 27 Press Conference to learn more specifics. Tito and Musk seem to be filling a hiatus in manned space missions to the moon and planets given cut backs in NASA funding. But are they really? Have official US manned space flights to other planetary bodies come to an end due to a stagnant U.S. economy? Not so according to the memoirs of former U.S. President Ronald Reagan. Reagan’s comment was very revealing since the recently retired Space Shuttle held a maximum of eight people and only five were built for space flight. Even if all five took off fully loaded it would be impossible to place and maintain 300 astronauts in orbit. It couldn’t be any clearer. President Reagan was revealing the existence of a highly classified space program that could accommodate hundreds of astronauts in orbit. Military and corporate whistleblowers that have come forward to reveal what they know of classified antigravity space vehicles, would agree with Reagan. Hidden within one of the nine unified combatant commands of the U.S. military, as British hacker Gary McKinnon discovered back in 2002, is a highly classified fleet of ships that operate in deep space. The classified name of this secret space fleet is alleged to have been “Solar Warden”. The trip to Mars and back by the not so secret U.S. space fleet can be expected to be far less than the 501 days Tito plans for his 2018 space venture. Many anomalies that appear artificial have been found on Mars, and the moon for that matter, using NASA satellite imagery by Waring and other researchers. NASA scientists routinely attribute such anomalies to purely geological processes and don’t bother to investigate further their possible artificial nature citing mission priorities and costs. In the rare case of a public outcry as happened in the 1976 Viking Face on Mars controversy, NASA will schedule future missions to provide further satellite images that typically only raise further questions. I was looking over Google Mars and discovered what looks like the equivalent of the Star Wars land cruiser. You can make out the shape and structure very well and even the two vertical wings in back. Using Google Ruler I found that the craft is 61 meters from nose to end, 33.3 meters from tail to tail, 29.23 meters wide and 4.8 meters thick. Here is what a Star Wars land cruiser looks like, it does have a striking resemblance to what Warring discovered. Waring created a Youtube video using Google Mars Map where he zooms in on the object that certainly appears to be artificial in shape. Buried just under the Martian surface, it invites further investigation and analysis. Don’t expect NASA scientists to rush to examine Waring’s claim by sending a rover mission to investigate. Maybe the secret Space Fleet that Gary McKinnon discovered by hacking into Pentagon computers and Ronald Reagan revealed in his memoirs, could investigate. If so, don’t expect the results to be announced anytime soon. Perhaps we will not have to wait too long, if Elon Musk succeeds in putting 80,000 colonists on Mars. Waring’s UFO crash may be just an unusual geological formation; or perhaps in a time long ago, there were “Star Wars land cruisers” racing over the Martian surface. Yesterday, NASA’s Jet Propulsion Laboratory (JPL) took the extraordinary step of dampening speculation over comments made by one of the leaders of the Mars Curiosity Mission. 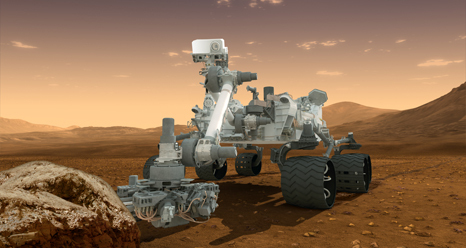 Just before Thanksgiving, on November 20, John Grotzinger, principal investigator of the Surface At Mars instrument on the Curiosity Rover, was quoted on NPR radio that a discovery had been made that would be “one for the history books.” Many scientific observers took that to mean that he was about to announce that Curiosity had discovered organic compounds on Mars – the building blocks of life. In an interview with US News, JPL spokesperson Veronica McGregor says that Grotinsky had been “misinterpreted”. She said that there were definitely nothing significant about organic compounds in the results to be announced at a scientific conference next week being hosted by the American Geophysical Union in San Francisco. Rather than an earthshaking announcement, it appears that Grotzinger will be presenting much more mundane data and results about the Curiosity Mission – its working fine after a long flight from Earth! Did Grozinger simply overreach himself in commenting about the data and results from a soil analysis by the Curiosity Rover, or is he being muzzled by more senior NASA figures over what was exactly found on Mars? He was extremely excited and continues to be extremely excited that we had the first data coming back from our first sample and the machine is operating beautifully… This was the science team's equivalent of the landing moment. It was a key moment after years of work. We're getting data from SAM as we sit here and speak, and the data looks really interesting. The science team is busily chewing away on it as it comes down…. This data is gonna be one for the history books. It's looking really good. What’s clear from Grotzinger’s own comments is that the data itself is “one for the history books,” not the Curiosity mission or the scientific process by which the data is being transmitted. In claiming that Grotzinger’s comments were being misinterpreted and that he meant that it was the “mission”, not the “data” that was one for the history books, McGregor is being disingenuous. Did Grotzinger simply misspeak, setting off much speculation about the data results from one of the Mars Curiosity soil analysis experiments? Or is Grotzinger and his data being muzzled by NASA? One thing now appears certain. Nothing extraordinary will be announced at next week’s American Geophyiscal Union conference in San Francisco where Grotzinger will announce the results of a soil analysis by the SAM Rover instrument. Maybe there was nothing extraordinary to be announced all along; or, perhaps, NASA is muzzling something extraordinary that Curiosity has discovered on Mars. In 1606, King James I of England granted the first Royal Charter to establish colonies in the New World. In a modern day reprise, Elon Musk, the founder of Paypal, Tesla Motors and SpaceX, plans to build a colony of up to 80,000 people on Mars. Taking a trip to Mars, if Musk has his way, would cost as little as $500,000. Musk revealed his long term plans in a November 16 presentation at the Royal Aeronautical Society. In an interview, Musk revealed that establishing a Martian colony was his ultimate objective, and “it always has been.” Given his recent space accomplishments, successfully sending an unmanned space vehicle to the International Space Station and back – Musk’s Mars vision is no idle pipedream. While it may take several decades to achieve his vision using conventional rocket propulsion technologies, this could be a new first for Musk. Or would it? According to whistleblowers, elements of the US military possess a secret space fleet that uses antigravity technologies, and is already capable of interplanetary flight to Mars and beyond. A secret attempt to declassify antigravity technology by the Boeing Corporation during the Clinton administration failed. Apparently, the world’s leading aeronautical company was prevented from introducing the next generation of propulsion technologies for the aviation industry for national security reasons. There is also reason to believe that there was an unsuccessful attempt by the Obama administration, under his former national security advisor General Jim Jones, to have antigravity technologies declassified. One day in the not too distant future, currently classified antigravity technologies that will revolutionize the aviation and space industry will be released. 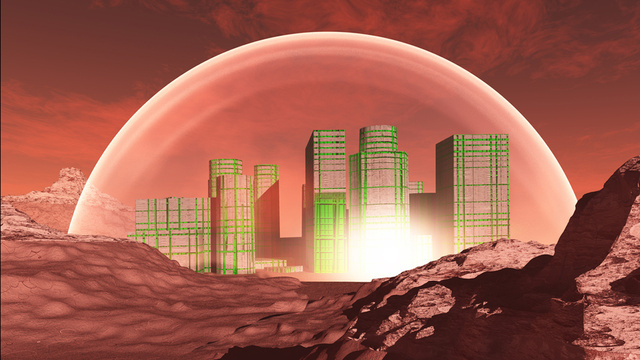 Musk’s vision of a Mars colony would then come into fruition much more quickly than he can currently envision. Elon Musk’s immediate plan is for SpaceX to send manned flights to the International Space Station in the next few years. With two successful missions to the ISS and back using his Dragon Spacecraft, there is little doubt that Musk will achieve his goal unless something unexpected happens. Musk will eventually turn his attention to Mars, and contemplate how to achieve his vision using existing propulsion technologies based on iquid fuel propellants. In his talk at the Royal Aeronautical Society, Musk said: “At Mars, you can start a self-sustaining civilization and grow it into something really big.” The main challenge is that present propulsion technologies make manned missions to Mars prohibitively expensive. NASA has dropped plans for a manned mission to Mar due to the 100 billion budget. With a yearly budget of only $19 billion, NASA would have to be part of an international consortium, and even then the overall cost might be too much. So can private space entrepreneurs such as Musk, succeed where governments cannot? Perhaps, but Musk would do so far more quickly if classified aerospace technologies based on antigravity principles were released. Classified antigravity technologies have been kept from the public realm for over six decades while secretly developed by military-corporate entities. It was revealed in 1992, for example, that the B-2 Bomber used electrostatic charges on its leading wings and exhaust. According to aerospace experts, this was confirmation that the B-2 used electrogravitic principles based on the Biefeld-Brown Effect. The Biefeld-Brown Effect is based on the research of Thomas Townsend Brown who in 1928 gained a patent for his practical application of how high voltage electrostatic charges can reduce the weight of objects. The B-2 bomber employs sufficiently high voltages to significantly reduce its weight. This enables the B-2 and other classified antigravity vehicles to display flight characteristics that appear to defy conventional laws of physics. During the early period of the Obama administration there may have been an attempt to have such technology declassified. The key Obama appointee for the attempt to introduce antigravity technology into the public sector was very likely General James Jones who was President Obama’s first national security advisor. After retiring from the Marines on February 1, 2007, General Jones served on the Board of Directors of the Boeing Corporation from June 21, 2007 to December 15, 2008. Boeing had been active at least since the early 1990’s in studies to apply antigravity technology for commercial use. In 2002, an internal Boeing project called “Gravity Research for Advanced Space Propulsion” (GRASP) had been disclosed to the aerospace industry. A GRASP briefing document obtained by Jane’s Defense Weekly stated Boeing’s position: “If gravity modification is real, it will alter the entire aerospace business.” According to a 2008 book by Dr Paul LaViolette, Secrets of Antigravity Technology, Boeing completed a separate classified study for the U.S. military of electrogravitic propulsion recently before October 2007. Boeing was rebuffed in its efforts to have such technology declassified and released into the public sector. As a Board Director and member of Boeing’s Finance Committee at the time of the 2007 classified study, General Jones was privy to and supported Boeing’s efforts in antigravity research and development. To secure America’s long-term energy security, America must reexamine outdated and entrenched positions, become better informed about the sources of our fuel and power, and make judgments based on facts, sound science, and good American common sense. As Obama’s first National Security Advisor, General Jones was well placed to ensure that “new energy ideas” would be integrated into a comprehensive national security policy by the Obama administration. Unfortunately, Jones was stymied in his efforts to move forward with his new energy agenda, and was replaced in October 2010 less than two years after taking the job. As happened earlier during the Clinton administration with the Boeing Corporation, efforts to declassify antigravity technology for the civilian aviation sector had been stymied by powerful opponents. There is little reason to doubt that space entrepreneurs such as Elon Musk could succeed in ambitious plans to achieve manned space flight to Mars, and eventually establish a human colony of up to 80,000 or more. Musk could become a modern day equivalent of William Penn and others granted Royal Charters by the English Crown that established colonies in the New World during the 17th century. The cost and time for achieving Musk’s Mars vision will take several decades using conventional rocket propulsion technologies. If antigravity technologies were declassified and released for commercial application, then Musk’s Martian colony could be brought into fruition much sooner – even before the end of this decade. A $500,000 ticket to Mars may not be that far off into the future after all! NASA is about to make a big announcement from its Curiosity Rover Mars mission according to John Grotzinger, its principal investigator. Will it be a giant leap forward in the search for life on Mars? Speculation began soon after Grotzinger gave an interview on NPR public radio on November 20 where he said: "This data is gonna be one for the history books. It's looking really good." In the NPR interview, Grotzinger said it would be several weeks before his team would announce their finding. A clue as to what was discovered is that the data comes from Curiosity's Sample Analysis at Mars instrument – basically an onboard chemistry lab that is capable of identifying organic compounds – the carbon-containing building blocks of life as we know it. While organic compounds do not necessarily mean that life exists/existed on Mars, they are a vital ingredient in the formation of life. NASA’s big upcoming announcement is most likely to be that it has discovered organic compounds on Mars – possibly, the fossilized remains of ancient Martian microbes. It is well worth contemplating how we reached this moment of discovery. More than 4 billion years ago this piece of rock was formed as a part of the original crust of Mars. After billions of years it broke from the surface and began a 16 million year journey through space that would end here on Earth. It arrived in a meteor shower 13,000 years ago. And in 1984 an American scientist on an annual U.S. government mission to search for meteors on Antarctica picked it up and took it to be studied. Appropriately, it was the first rock to be picked up that year — rock number 84001. Today, rock 84001 speaks to us across all those billions of years and millions of miles. It speaks of the possibility of life. If this discovery is confirmed, it will surely be one of the most stunning insights into our universe that science has ever uncovered. Its implications are as far-reaching and awe-inspiring as can be imagined. Even as it promises answers to some of our oldest questions, it poses still others even more fundamental. The 1996 discovery then got bogged down in scientific debate over whether or not the meteorite was polluted by Earth microbes. Critics claimed NASA scientists had not sufficiently accounted for this possibility. Not so according to a new 2009 study by NASA scientists, including McKay, from the Johnson Space Center that upheld the earlier findings and concluded: “None of the original features supporting our hypothesis for ALH84001 has either been discredited or has been positively ascribed to non-biologic explanations." The continuing debate over the 1996 Mars meteorite has led to Grotzinger and his team taking a cautious approach to announcing the results of their analysis of the data sent back by Curiosity’s SAM instrument. If, as Grotnzinger suggests, the results are upheld, we will soon hear that organic compounds have been found on Mars. More importantly, they might be the fossil remnants of ancient microbiological life. You can then expect President Obama following in the footsteps of President Clinton, and make his own public announcement concerning the implications of ancient life on Mars.